Recently, I had a few extra bars of soap lying around that I really did not know what to do with. 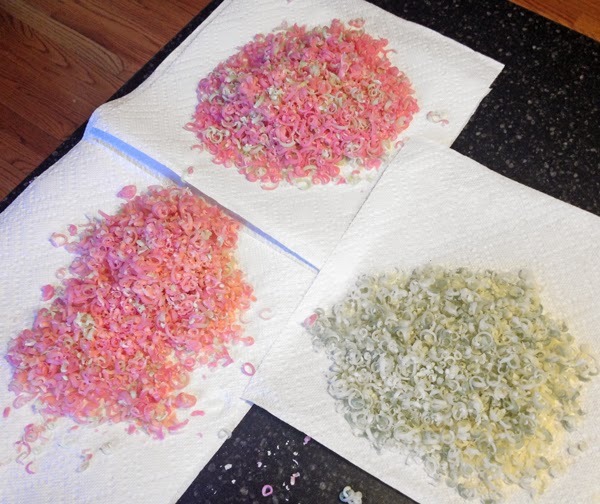 I came across this tutorial from the Otion blog and loved the look of the shredded soap embeds. 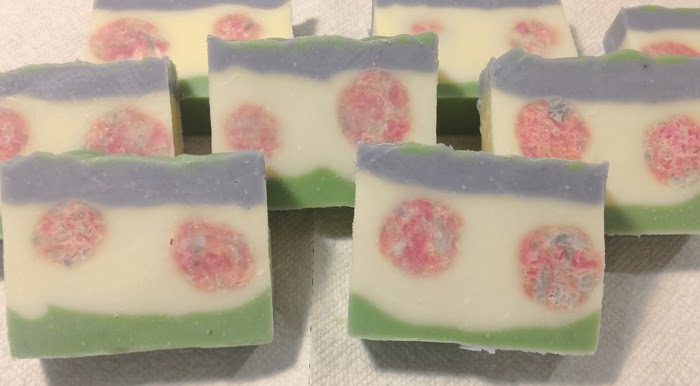 This tutorial used melt and pour as the base but I did not want to combine my bars of cold process into melt and pour so I decided to use part of that tutorial to create the soaps below - all in cold process. This was a great place to start, but I made several modifications along the way that I will share here. Please note that this is not a beginner tutorial. Log mods that will hold your base recipe PLUS the extra 13 or so ounces for embeds. My 50 ounce oil recipes fit beautifully in my 15" log mold so I used my 2 - 9" log molds to hold this recipe PLUS the embeds - the extra 3" (15" to 18" total) overall worked great. 1. Grate your 3 bars of CP soap. My soap was about a year old and completely cured. Fresh soap is easier to work with but not necessary. I kept each bar into a separate pile of shreds so I could blend the colors as I made each ball. 2. 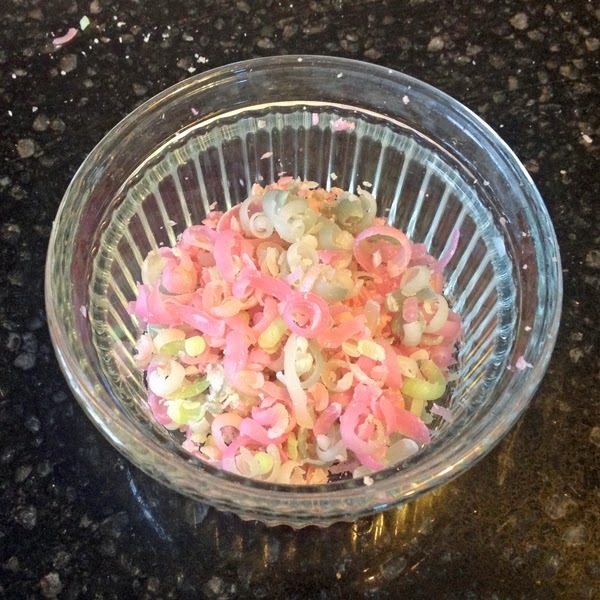 Take a portion of the shredded soap and place into a microwavable container. Spritz with a bit of water. 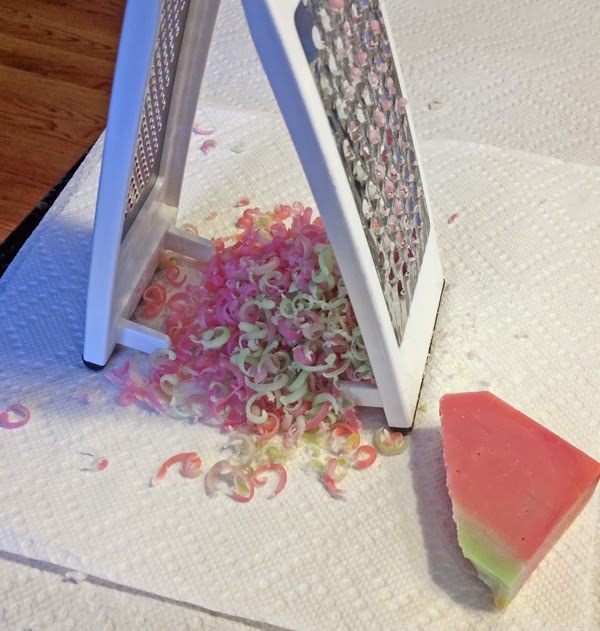 Heat this shredded soap for about 10 seconds. 3. 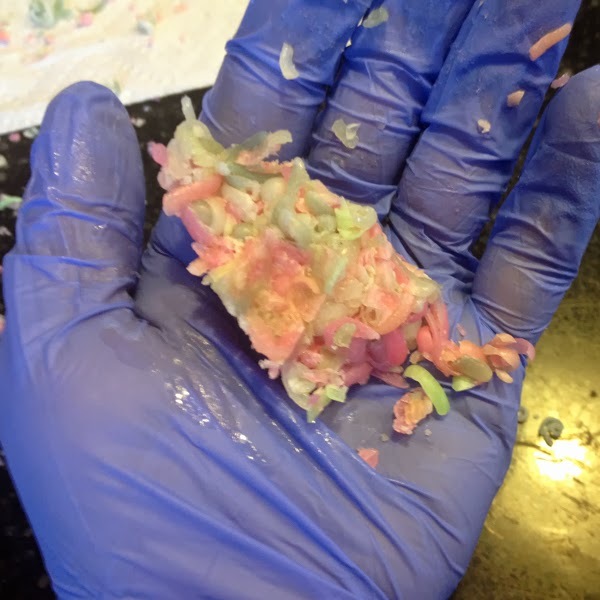 Take the warmed soap and form the shreds into a ball. You will want these to be 1 - 1 1/2" in diameter. 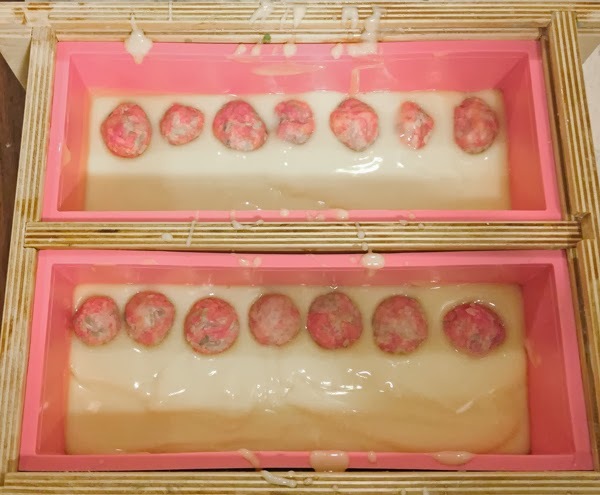 If you do not spritz with water and warm up the soap and it is fully cured, you may have difficulty getting the balls to keep their shape and not crumble. If you soap is fresh, it should form into the balls without adding water and warming. 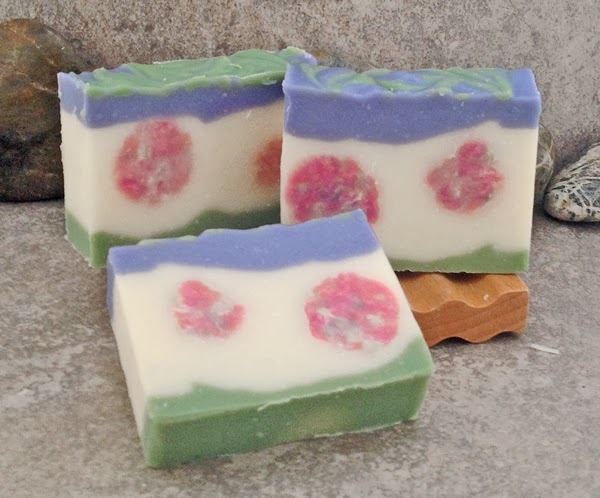 Warming them up too much and the colors may blend into a single color instead of giving you the mottled look you should get with multiple colored soap. This is similar to slightly rebatching your soap. If you are not going to use the soap balls right away, store them in a ziploc bag so they do not dry out. 4. 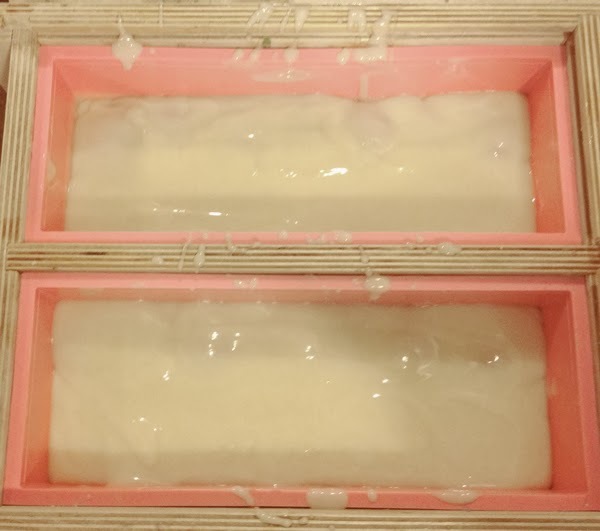 Now it is time to make your cold process soap base. 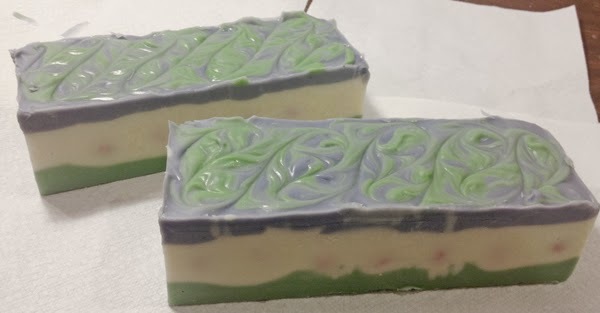 This soap will be layered with 3 colors - the middle section will not be colored as that is the section I will be adding the embeds to so that they can stand out. 5. When your soap has emulsified but is still thin add your fragrance and pour 2 - 2 1/2 cups into 2 separate containers for your colors. 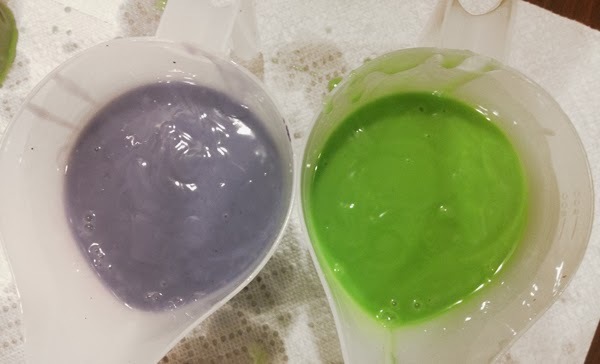 I used green chrome oxide for one and a combination of ultramarine blue and ultramarine violet to get a lavender color for the other. 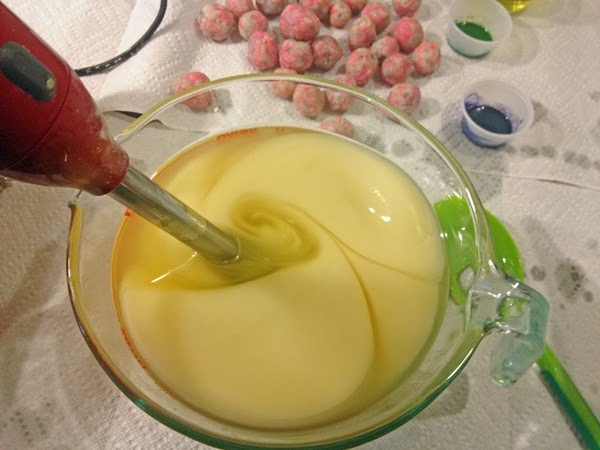 Mix the colorants into the soap well - I first blend my oxides with a bit of the oil from my oil blend, otherwise you may get specks of color. You want your bottom layer color to thicken up faster, so give it a bit more mixing to medium to thick trace. 6. 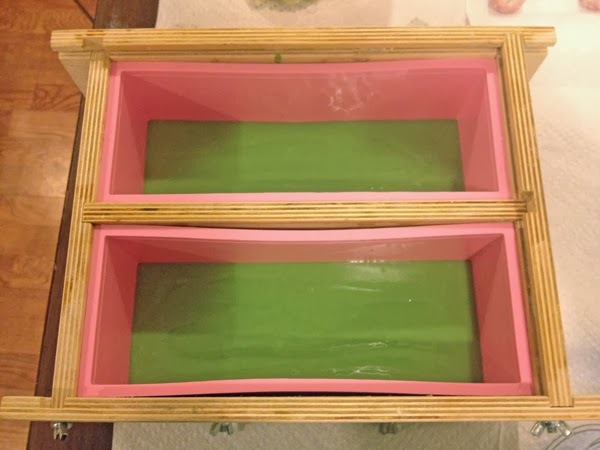 Pour your bottom layer into your soap molds (I am using 2 - 9" log molds). 7. 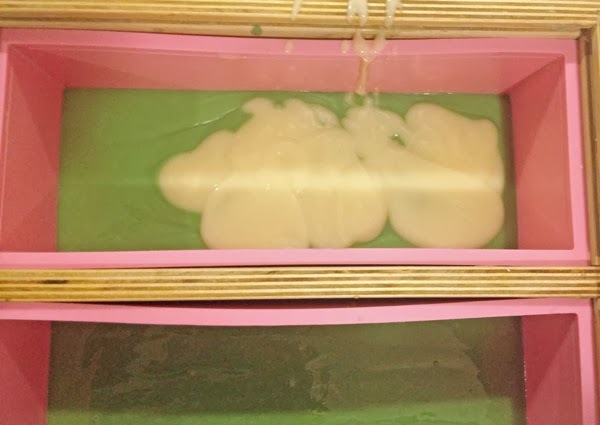 Slowly layer about 1/3 of the uncolored soap on top of the bottom layer. 8. 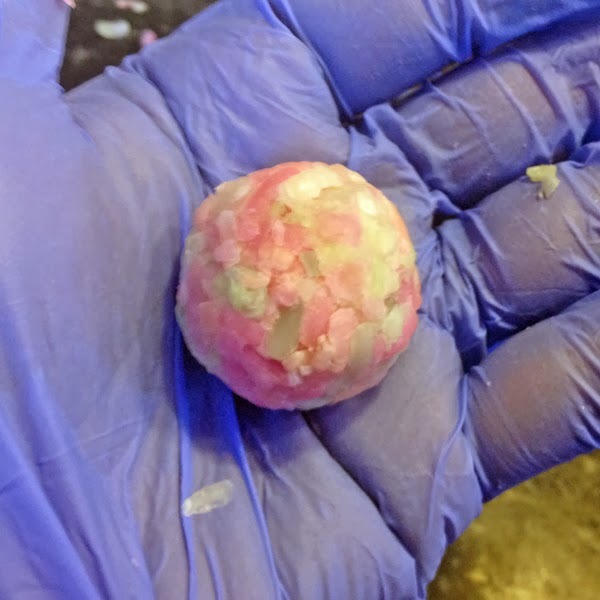 You can get creative here and place your previously made soap balls wherever you want in this middle layer by placing them, adding more uncolored, placing more soap balls, etc. until the middle layer of uncolored soap and the soap balls is complete. 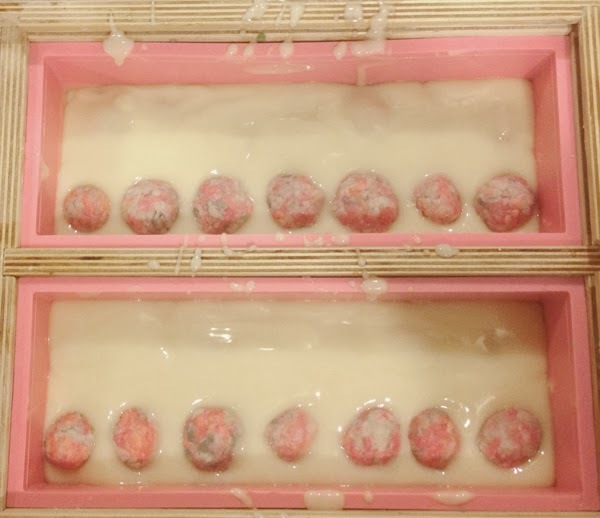 I placed one row on one side, added more uncolored, then placed another row of soap balls on the other side and topped it off with the last 1/3 of the uncolored soap. 9. 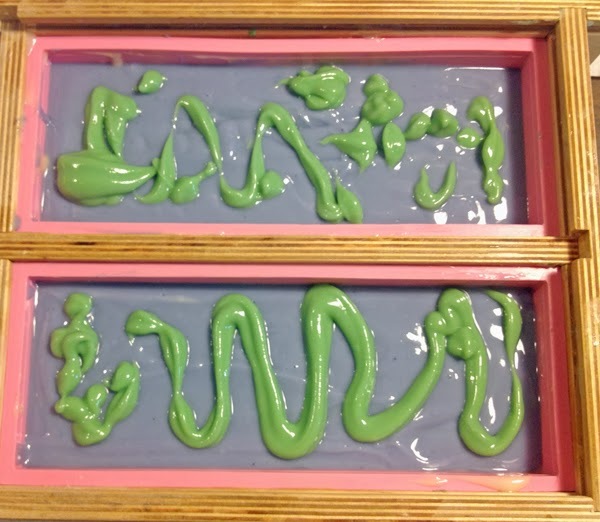 Carefully pour your top layer of soap. 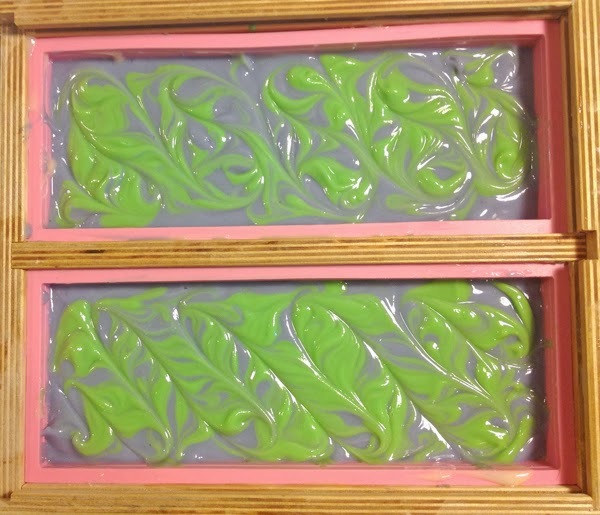 Make sure to lightly bang the mold to remove air bubbles as your soap will be thicker now, but not too hard that your soap embeds sink down. 10. Decorate the top however you please. I had some extra green so I decided to swirl that into the top. If you have extra embeds, you can place them here too. 11. I covered and insulted these logs for about 24 hours then cut them. 12. 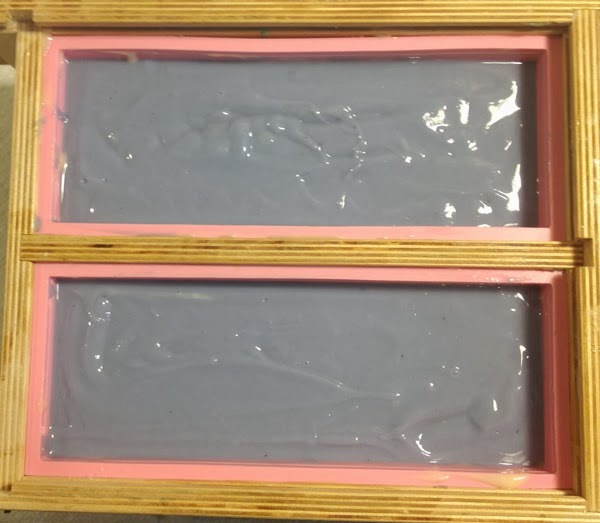 Freshly cut soap bars. 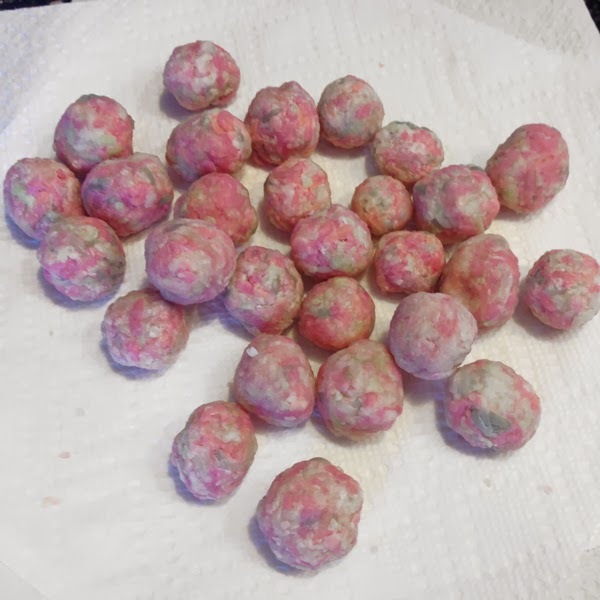 You can see how nicely the soap balls have that mottled look from blending the various colors of soap shreds. Copyright 2006 - 2014 Alaiyna B. Designs. All rights reserved. All text and images are the property of Alaiyna B. Designs and Alaiyna B. Bath and Body. No part of this document or webpage may be reproduced by any means without prior written consent of Alaiyna B. Designs.